Jayson Tatum debuted the Nike Kyrie 4 Green Lobster in tonights win to take a 3-2 lead over the Cleveland Cavaliers. This is a follow up to the “Yellow Lobster” pair that released exclusively at House of Hoops locations early 2018. Inspired by Concepts’ and Nike SBs collaboration from 2009, this iteration comes dressed in a Celtics’ Green scheme with its signature inner lining pattern. As of now, there are no release details of the “Green Lobster” Nike Kyrie 4s becoming available any time soon. Stay tuned to Sneaker Bar for more updates. 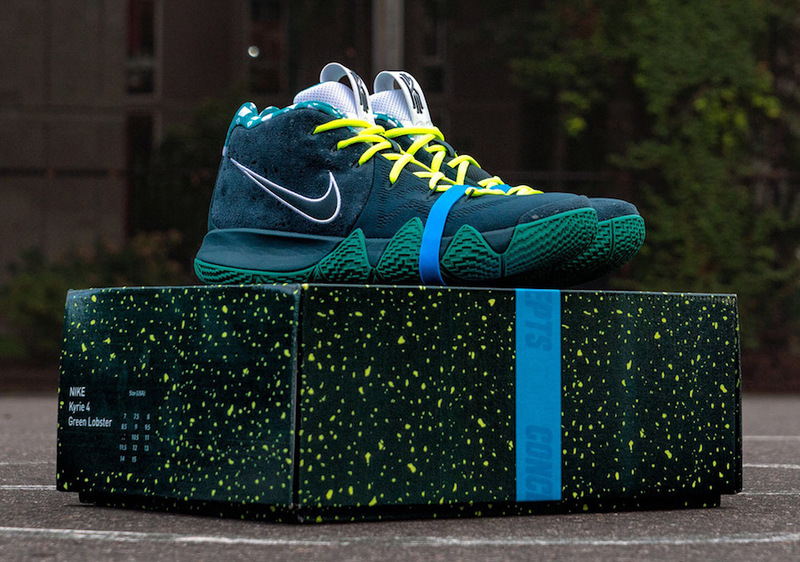 UPDATE: Concepts has just revealed how to buy the “Green Lobster” Nike Kyrie 4s. They’ll release them via raffle today (8/31) at Corporal Burns Park from 10AM-1PM. Meet at the basketball courts ASAP for your chance to purchase a pair of Green Lobsters. UPDATE: Concepts’ Deon Point has revealed a detailed look at the upcoming “Green Lobster” Nike Kyrie 4, which indicates that a release will be going down sooner than later. The shoes were also part of their recent Fall 2018 clothing collection. Stay tuned for more updates. UPDATE: Concepts gave us a look at their latest Fall 2018 clothing collection, which includes custom tees and hoodies featuring graphic embroidery, with printed metallic emblems, and all cut and sew pieces are constructed in the United States with Japanese fabrics. In addition to the clothing collection, they also teased an upcoming footwear collaborations with Nike, Mephisto, and Birkenstock, including the Kyrie 4 “Green Lobster” that Jayson Tatum originally debuted back in May. The collection is available on Friday, August 17th in Concepts’ Cambridge (10AM), Boston (10AM) and New York (11AM) locations, and online at CNCPTS.com at (11AM EST). The footwear lineup will become available at a later date.